We are excited to see the continued growth in the diversity of backgrounds. Out of 84 students, there are 69 companies represented. These students span all industries, and we are excited to see the addition of more students from Healthcare. We have representation from many of the healthcare leaders in Houston and our students have backgrounds in Entrepreneurship, law, and nursing. Our students also have robust educational backgrounds, as we welcome students with PhDs, RNs and JDs to our class. Other industries include non-profit, financial services, manufacturing, energy, real estate, consulting and technology. We even have some new industries this year, making this class even more professionally diverse: telecommunications, retail, and hospitality/consumer services. Our representation of women has grown from 27% to 31% and we are excited to welcome some outstanding leaders to the class. 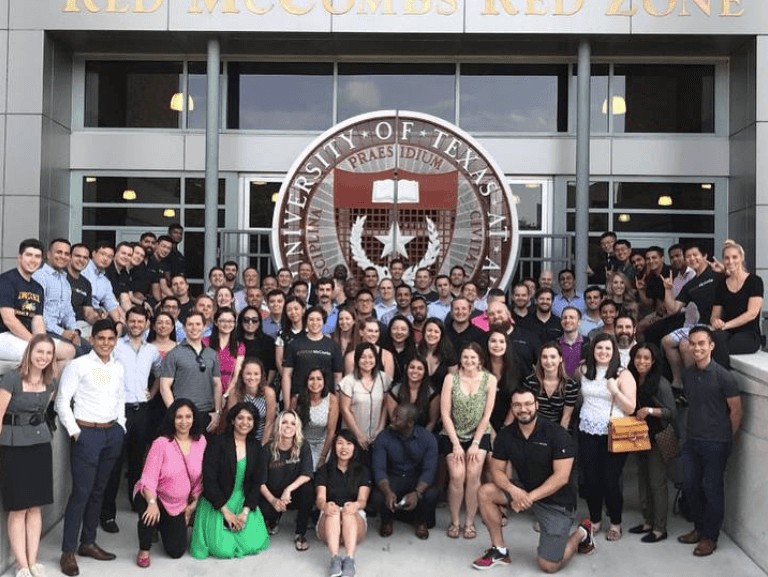 The MBAs in Houston also represent three of the five branches of the U.S. military with members from the Army, Air Force, and Navy. 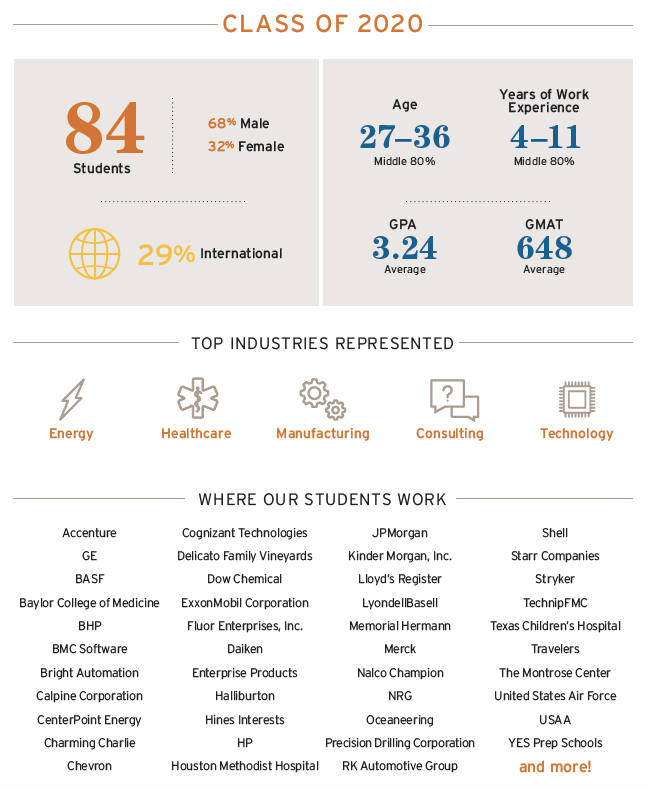 MBAs in Houston come from 15 different countries. It’s also been important to our class to see growth in both under-represented minorities, up to 20 from 13 students last year, and first-generation students. We have a large number of repeat Longhorns coming back to UT this year and many Texas A&M Aggies joining the herd. (We love our AgHorns.) Overall, we have 53 different undergraduate universities represented, including Stanford, MIT, and Georgia Tech. 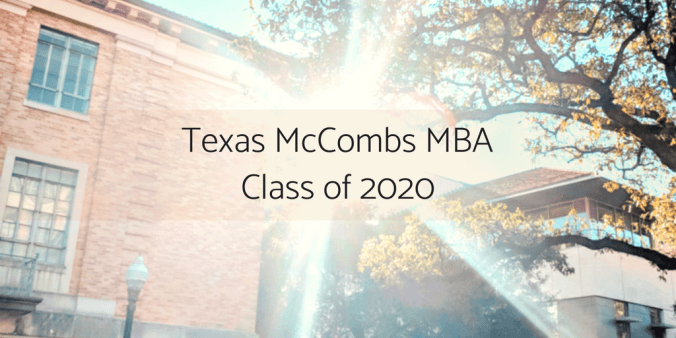 This post is part of our MBA Class of 2020 series. Soon, we’ll explore our Executive MBA Class of 2020, so be sure to check back. When is the Best Time to Submit Your MBA Application?